What keeps the Royal valets busy (and the King always takes a couple with him,—like Count D'Orsay) is the constantly growing stock of official clothes, because Albert Edward is a stickler for etiquette. If he goes to an army ceremony, he wears the uniform of the Field Marshal, and he attends naval affairs dressed as an Admiral of the Fleet. Much nonsense is customarily talked and written about the King's clothes. But with every deduction made for the imagination of talkers and writers, the fact remains that Edward VII travels with a good deal of baggage “whene’er” (as the Isaac Watts hymn puts it) “he takes his walks abroad.” The King is a man of sense in regard to dress, whatever he may be in any other respect; but I do not think he carries about, or wears more ordinary clothes, than any other gentleman of high position. What keeps the Royal valets busy (and the King always takes a couple with him,—like Count D'Orsay) is the constantly growing stock of official clothes, because Albert Edward is a stickler for etiquette. If he goes to an army ceremony, he wears the uniform of the Field Marshal, and he attends naval affairs dressed as an Admiral of the Fleet. 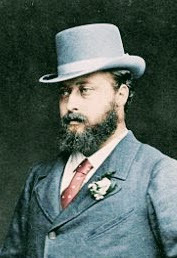 Similarly, when he went to Kiel the other day to visit his nephew (whom the irreverant call William the Bumptious and the punctilious Kaiser Wilhelm) he took along, not only a sufficiency of yachting suits and flannels—though the King hates flannel—but also a full rig out for every German and Prussian regiment of which he is an honorary officer; and conforming to the ridiculous and meaningless custom of European courts he is in that position with regard to a good many.